Its been so hard keeping this under my hat. I actually ordered a Mini Egg a month ago, but didn’t want to let the cat out of the bag until I took delivery of it. Let me tell you, that month dragged by for me. The problem is our Egg dealer lives across the state….and by across the state I mean ACROSS the state. Really far away. To get my large Egg, I had to drive to Corpus. For this one, we had to drive to Hunt, Texas. I know there are closer dealers, but this just happens to be Mrs. G’s best friend, so I’d rather give my business to them. 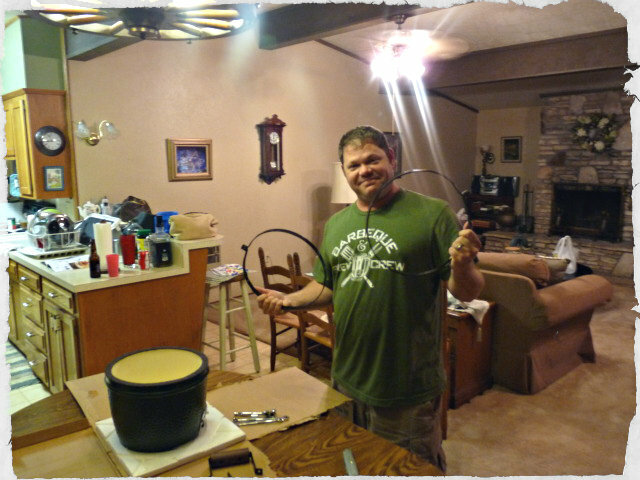 After dinner, Mr. O and I got started putting my new Mini together. Where do these parts go? I don’t need no stinking instructions!! 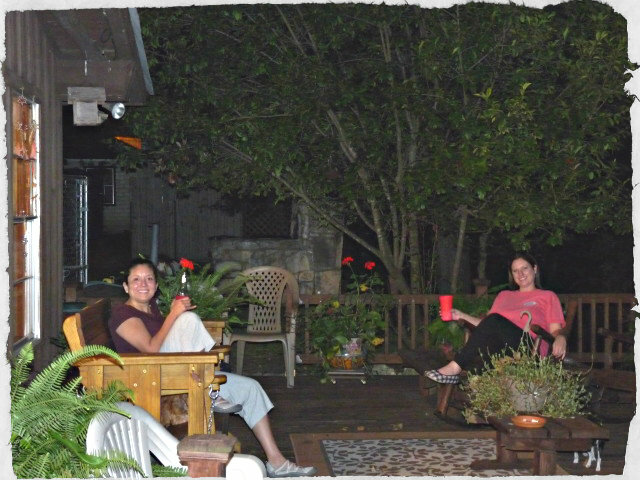 While we were hard at work, the women folk enjoyed a cold beverage outside on the patio. “I can’t believe they are inside putting it together tonight. They couldn’t even wait till tomorrow. I know, right? Boys and their toys.” At least, that’s how I pictured their conversation going. Actually it wasn’t that hard to put together, nor did it take that long. Nothing got cooked that night, as we had already eaten and it was late, so we enjoyed a few cold beverages before turning in for the night. Portability – much easier to move around than a large. Now, we can take it to the ranch, camping or tailgating. Fuel Efficient – the Mini seems to burn less charcoal than a large (at least it seems that way to me so far). Often, it’s just me and Mrs. G cooking for ourselves. 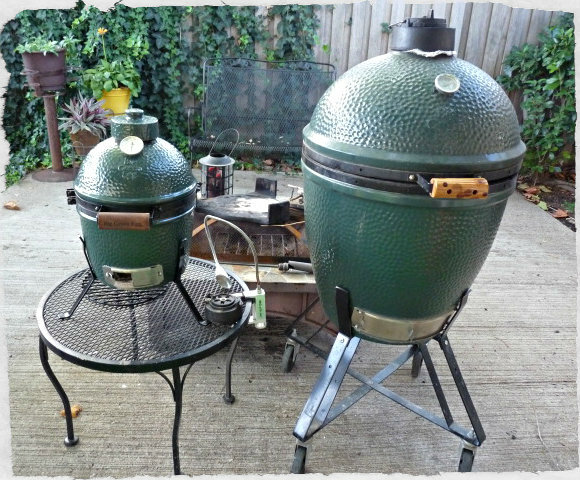 The Mini is big enough to meet the needs for these small cooks and we won’t use as much charcoal. 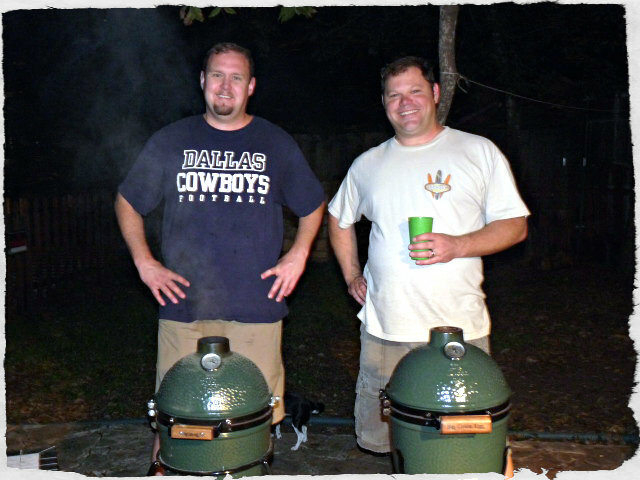 Quicker – the Mini comes up to temp faster than the large so we can start cooking faster. Flexibility – with two Eggs, we can cook different foods on each that require different temperatures. 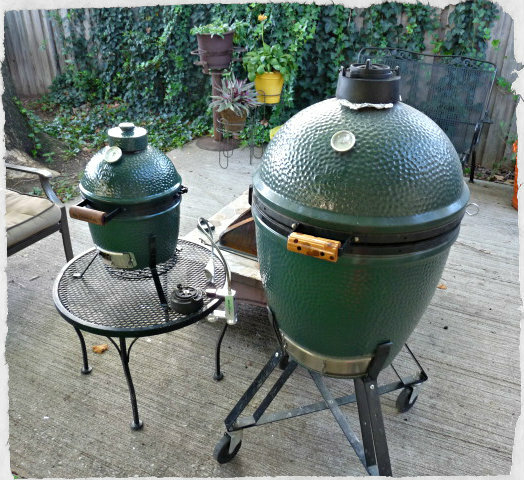 For example, we can have a brisket (or butts or ribs) going along on the Egg at 250 for dinner. If we get hungry for lunch, we can fire up the Mini for burgers or hot dogs. Or we can prepare small side dishes on the Mini. It just allows for more options. Tons of food got cooked this past weekend. Way more than I can include in one post, so stay tuned throughout the week to see how well the Mini cooked and what we cooked on it. You won’t be disappointed. Congrats on the new mini. I eventually want to add one, especially for its portability, but I’m seriously thinking about getting a second large in the near future. I thought about getting a second large, but really wanted something portable and something for smaller cooks when its just the Mrs and I.
Congrats on the safe arrival of the “wee” one. I also noticed a huge difference in the fuel consumption of a medium vs a large, the mini could probably cook with a tea candle. Thanks. We are loving it so far. Comes up to temp in no time flat. We are going to have to get us one of those green eggs! You have really sold us on the advantages of one. I find it admirable that you stay loyal to your small business owner…..we need to do more of that in today’s society! I really have to show Mr. Picky eater the smaller egg. We might try that one first! Thanks, we are having a blast cooking on it. Already planning dinner for tonight. Lucky you having mini egg! We borrowed one for a while and you are so right, it is ideal when there are just 2 people in the house! On my dream list! Thanks, I’ve been saving my pennies for awhile to get it. We love it so far. Maybe I could approach Santa????? That would be an idea. You sound like a proud Papa! Congrats and happy Egging. This is awesome! I’ve thought about what my next grill will be. We actually registered for a mini egg on our baby registry. Alas, no one bought it. I’ll be reading to see how it works for you! That’s a bummer. I’ve now cooked on it 5 days in a row, two of those days being apps, lunch and dinner. We are living it so far. Got a lot of posts I need to get written up and posted. Lookie at da baby. She’s cute!!! She is a she, right? Ya know, Jen….I’m not real sure yet. Alexis has been wanting a Mini for over a year. I know we’ll eventually break down and get one. Ours is getting plenty of use already. Perfect for cooking small meals for just the two of us. And it gives you the versatility of having a second egg going at a different temp, but you already have multiple eggs, don’t you? Yes two larges but she wants a mini. Minis are wonderful grills, but a bit pricey. 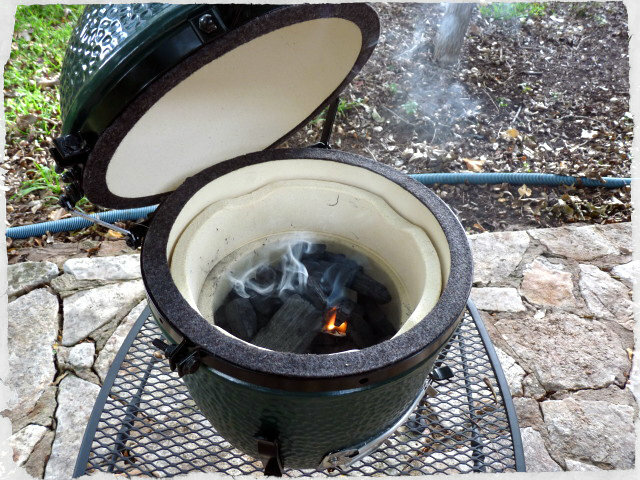 I think for my next grill, I am going to stray away from BGE and Kamado style cookers. Maybe go with something old school. I recently found out that the very first grill I ever owned (some 16 years ago) is still in production. I’ve been thinking about picking one up to relive old memories.